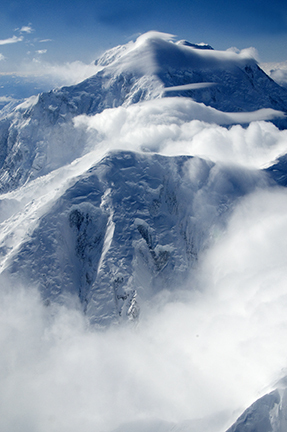 Many visitors to Alaska probably bypass taking a flightseeing tour. First, they can be expensive, especially for two or more people. Secondly, you never know what the weather will be, and to plan a good portion of a day around this activity could be disappointing. 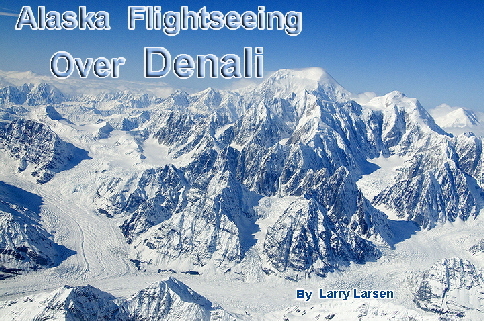 But on our recent trip to the Denali/McKinley area, we decided it was time to give it a try. After all, this is supposed to be the Mecca of flightseeing destinations. 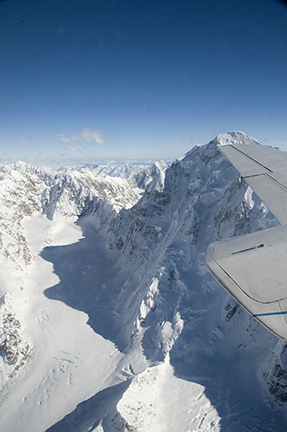 We scheduled our trip with Talkeetna Aero Services/Fly Denali after spending the night at the comfortable McKinley Chalet Resort drove to the beautiful, Mat-Su Valley. 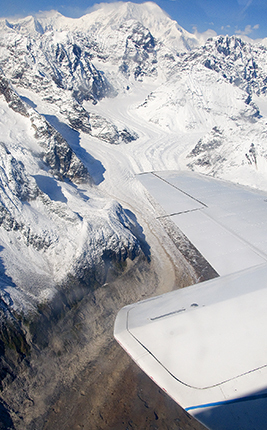 TAS flies from Talkeetna, Denali National Park and Anchorage and offers McKinley Summit Tour, Denali Glacier Landing, Glacier Tours and Denali Park Day Trips. We showed up for the 11am flight in Talkeetna, but it had been cancelled and rescheduled for 1 pm so fortunately it gave us time to go into the small town and have lunch. What a nice surprise! 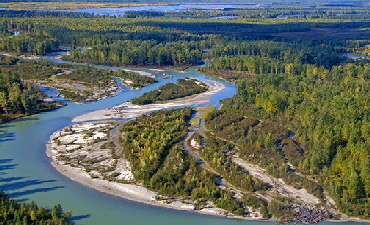 Talkeetna, with a population of under 500 people, itself is a unique town listed in the National Register of Historic Places. Established in 1919, it still has that Alaska small town flavor. As we strolled through town, we saw original log buildings that add to the rustic look and character of the small village. We had lunch at the West Rib Deli & Pub and, for the first time since we arrived in Alaska, we were able to try an elk burger. Seems that elk is not harvested commercially so it is impossible to find it at most restaurants. The lean meat was excellent. 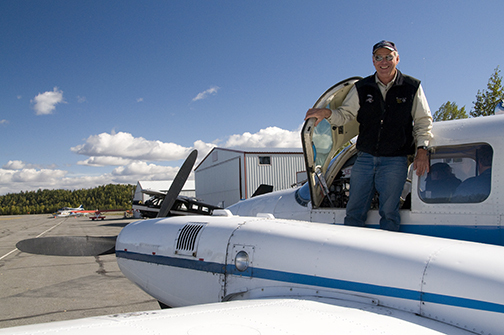 At the appointed time we returned to the flightseeing office and began our adventure. Our brief orientation in the plane included how to use oxygen masks. We would be flying at over 21,000 feet in a fixed wing plane, definitely necessary to avoid fainting at that altitude. According to our pilot, it was one of the most cloudless, sunniest days of the season, and the views out of our window did not disappoint. What a spectacular experience! We were able to see the dramatic views of Denali's summit, the surrounding peaks and glaciers, and an amazing view of Denali National Park. We did indeed feel the excitement only a few mountaineers have experienced: the view from the top of North America's highest peak! 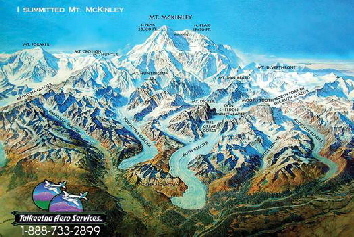 We viewed Mt McKinley (which the locals prefer to call Denali) perfectly from all angles (See Map). 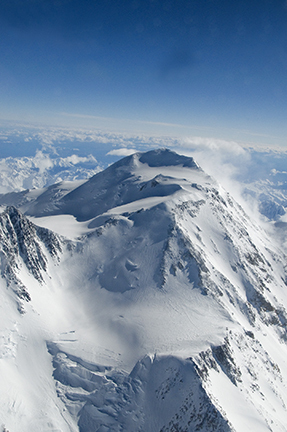 It, along with mounts Foraker, Silverthrone, Hunter, Huntington and Dickey were all covered with snow. 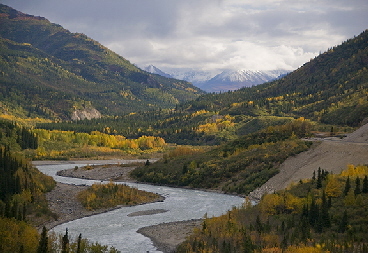 To help capture your imagination, many snow-covered valleys formed by the five large glaciers slowly roll downhill from McKinley. 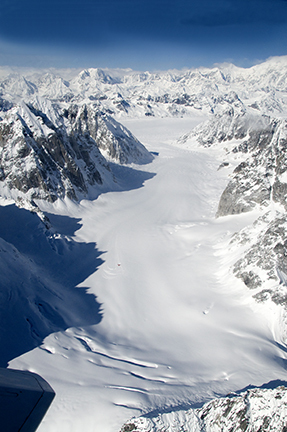 The Peters Glacier lies on the northwest side of McKinley, while the Muldrow Glacier falls from its northeast slopes. Just to the east is Muldrow and abutting the eastern side is the Traleika Glacier. 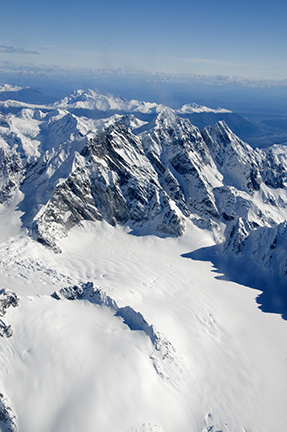 The famous Ruth Glacier lies to the southeast of the mountain, and the Kahiltna Glacier leads up to the southwest side of the mountain. How could climbers face this remote environment on foot to risk getting to the top, we'll never know. We climbed aboard a plane! 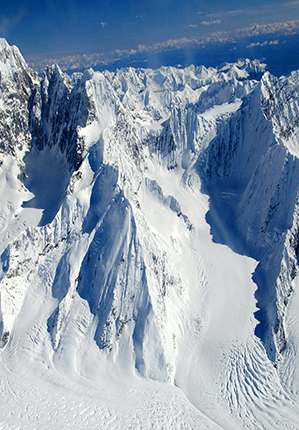 For more information on the area and flights, visit http://www.AlaskaVisit.com and http://www.talkeetnaaero.com or phone 1-888-733-2899. But this is a story best told with photos, which speak more than a thousand words we could write.